Extraction of oil is preceded by cleaning the seeds, peeling and pulverization, which results in making of meal. The meal then is treated by moisture and heat, moisturizing and heating the product in ovens or by jet steam. The product of this process is pulp, from which it is easy to extract the oil. 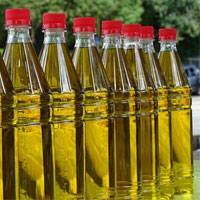 Pressed oil almost always contains substances which significantly degrade the quality of the product and should therefore be removed. Filtration of oil is necessary. Filtration can be mechanical, removing suspended particles from the oil. It is usually achieved by settling or by running the oil through special cotton fabric in press-filters. At this stage the use of centrifuges is also possible. Beside mechanical filtration, the process of refining includes degumming, winterization, bleaching, deodorization and polishing. Degumming is the removal of phospholipids, proteins and mucus substances. It is not a stand alone process and is used in combination with setting. First, the oil is washed by a small amount of hot water, then precipitated contaminants are removed by settling. Winterization is necessary to remove wax and paraffin from the oil. The combined influence of the vortex layer and the magnetic field intensifies the mixing process, creating the necessary conditions for efficient vegetable oil degumming. Neutralization is the treatment of oil by a water solution of sodium hydroxide. This process is based on the ability of free fatty acids to react with the alkali to form soapstock. The latter is insoluble in oil, settles to the bottom and can be easily removed. Adsorption refining is also referred to as bleaching. The ‘bleaching’ refers to the removal of oil-soluble pigments from the oil (chlorophyll, carotenoid etc). Bleaching of oil is performed under vacuum at the temperature of 75-80ºС. The product is mixed with a bleaching clay (bentonite or similar) and stirred for 20 – 30 minutes. This is usually sufficient to adsorb the pigments from the oil. Then the oil is settled and filtered through press-filters. Deodorization is a process of distillation, removing odorous materials from the oil, such as low-molecular fatty acids, aldehydes, ketone and other substances with detrimental effect on the smell and taste of the oil. Deodorization is also required to remove polycyclic hydrocarbons and toxic substances. The process involves purging the oil by jet steam in vacuum. It should be noted that complete refining of oil is not always necessary, however, filtration always is. When seeds are pulverized, the feedstock is never completely free of contaminants. Mechanical mixing of components in the production of vegetable oil is important in filtration of vegetable oil. Traditional equipment used for this purpose is unable to ensure complete contact of the components, overusing the feedstock and degrading quality and stability of the vegetable oil filtration process. A good alternative is the use of the vortex layer devices (AVS). The combined influence of the vortex layer and the magnetic field intensifies the mixing process, creating the necessary conditions for efficient vegetable oil degumming. For the specific results of the tests performed, refer to «Purification of vegetable oil using the AVS».